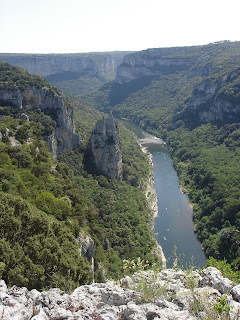 The Ardeche gorges are a protected natural area about 90 minutes south of Lyon. 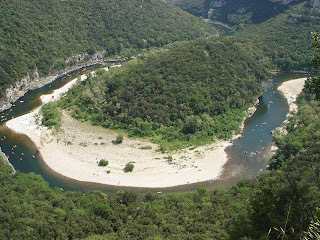 Though technically in Languedoc-Roussillon rather than Provence (Languedoc is west of the Rhône, Provence is east of it) the climate, flora and fauna are familiarly provencal. 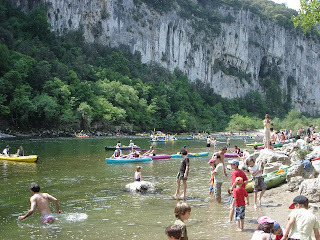 What draws people here, though, is the scenery: The Ardeche river, in its course to the Rhône, has worn into a deep gorge lined with sheer cliffs and pocked with caves. One of these caves, the Grotte Chauvet, contains the earliest known cave paintings (to avoid the fate that has befallen the more famous Lascaux cave, you can't visit the cave but there's an excellent website here). 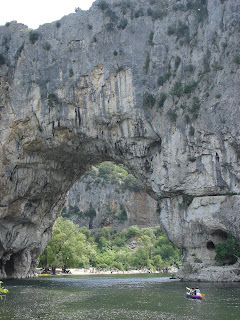 There is also a famous natural stone arch bridge that spans the river, the Pont d'Arc [photo]. The river, too, provides a significant draw--it is gentle enough that beginners can canoe or kayak down it, and as such it is very popular with school groups, outing clubs, and the like. On sunny summer days the stream of canoes is continuous [click to enlarge any of the photos of the river gorge; all the tiny multicolored spots are canoes]. Boog and I went on a weekend camping trip to the gorge, though we had to skip the canoe trip as kids must be 7 years old to make the passage. 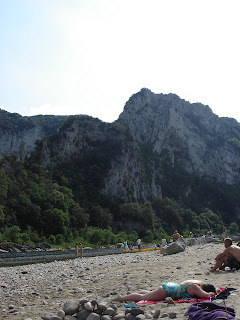 Our campsite was in a pretty wooded spot by a stony beach on the riverbank, with nice views of the cliffs [and occasional spotting of the beaching behavior of the Teutonic river whale, photo]. As I've mentioned before, French campgrounds are a little different; as I was whipping up some jambalaya for dinner on my trusty MSR Whisperlite backpacking stove (campfires strictment interdit), I realized that I was the only one in the campground cooking--everyone else was dining at the campground's onsite white-linen-tablecloth restaurant. 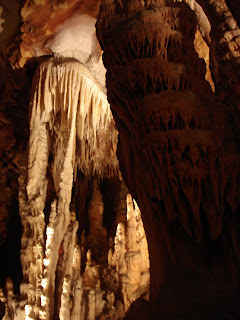 After a good bit of hiking on a hot Provencal day, a visit to one of the area's caves was in order. 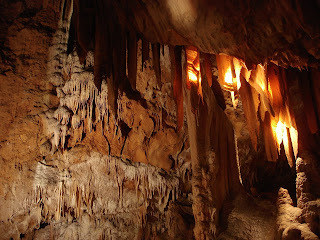 As there wasn't even a road into this area until the 1960s, the caves were unknown except to the locals, and were used by the Resistance in WWII (pretty much every remote/rural/underground location in France was "used by the Resistance", a sort of 20th-century "Washington slept here"). 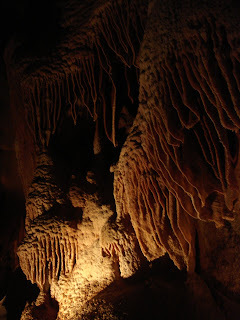 These photos are of the Grotte de la Madeleine, which has some spectacular formations that are exceedingly difficult to get a good photo of. Oh well. 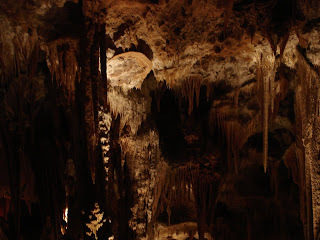 Also you'll just have to imagine the son-et-lumiere show in the cave's largest gallery, the cathedral [photo], complete with the inevitable gratuitous use of "O Fortuna"from Orff's Carmina Burana. This looks to have been our last out-of-town trip before the family moves home; we're trying to work in one last run to Paris, but the do-list keeps getting longer and there is less and less white space on the kitchen calendar as the days tick down. Still, I promised Boog we would climb the Eiffel Tower before leaving, so I suppose we'll have to find a way to make a day trip at least. Put yourself in V.'s shoes for a moment (they are very stylish but impractical and uncomfortable). You've been living in France with your husband and two young sons for two and a half years. You put yourself through grad school, built a private practice, and became a local expert in your specialty, but you cannot legally work in France, and your US practice license is going to expire unless you stack some CME credits pronto. You live in a place famed for its quality of life--relaxing at cafés and whatnot--but you spend all of your time doing laundry, changing poopy diapers, and riding the bus clear out to St. Foy and back to pick up your son from the only school in the area that doesn't recall Lord of the Flies. You live within a few blocks of some of the finest restaurants in France but you have to schedule with the babysitter six weeks in advance if you want to go eat at one of them on a Saturday night, because your babysitter has an infinitely more interesting and active social life than you do. Your apartment is fabulous but there's no air conditioning and no storage, and the elevator quits working in June and stays that way until September (like the rest of the French). You've seen Venice and Paris and Madrid and the Riviera and the Alps and, um, Manchester; you've walked the flagstones of silent cloisters and soaring cathedrals, plucked grapes from Burgundy vineyards, and watched the sun sink into the Mediterranean; you've seen Monet's garden, Chagall's grave, and Van Gogh's asylum; you've shopped at Hermes and Dior and Vuitton; right now, you'd settle for a place where people are nice to you before they've seen the color of your credit card. Your husband is basically a good guy but sometimes he just has no idea how, in this country and in this language, to get a part for the washing machine or how to ask why your renter's insurance rate suddenly jumped or whether it's normal to get two gas bills each month, and sometimes he just flings down the day's mail in frustration and stands staring out the window. You never thought you'd miss working, but you do. Most impoartantly, you have a lot of people you care about back home who are living, dying, getting married, having babies, laughing, crying; you share in this only through forwarded e-mails with jpegs attached, and the cruelest words, "wish you could have been here." How do those shoes fit? Would you keep them on, or would you trade them for ruby slippers, click your heels together and say "There's no place like home"? V. has chosen the ruby slippers. In about 5 weeks, in mid-July, she and the boys are moving back to our house in Chapel Hill for good. I will accompany them for 3 weeks of my vacation, then return to work here in Lyon to continue working. For how long, I don't know; not forever. Until I can find a suitable job back in the States and preferably in North Carolina. The Frogmarch will soldier on (at the very least, expect more frequent posts once I suddenly have a lot more time on my hands).